When we started to search for the veteran at the beginning of 2017, we could not know wether the search would be successful or not (like many times before). We knew the frogman only by his name, featured in battlefield reports since the mid 1950’s several times, and we knew the city in Germany where he lived after the end of the Second World War. When we virtually knocked at his door, nobody was there to open anymore. With a big portion of luck and the cooperation of his family, we connected a few months later to finally ask his family some questions, which the veteran himself was sadly not able to answer anymore. We provided some photos of the German “Kampfschwimmer” from 1944 and 1945 to the family, which they had never seen before, but which were part of our records since several years. 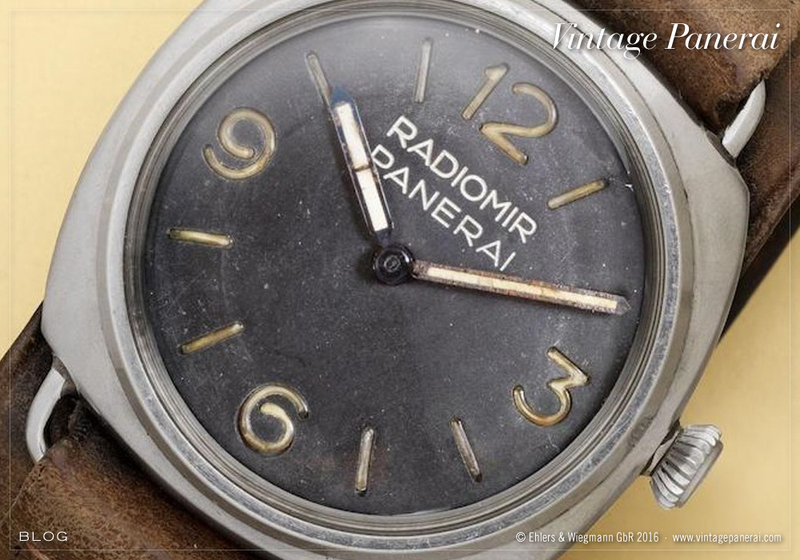 Recently we got photos of the Vintage Panerai watch, which the frogman stored in a safe place before the war was over and before he became a POW of the British. Before we saw the first photos, our “wild guess” was, that it could be a Ref. 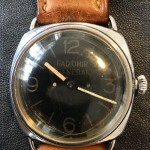 3646 / Type D. But the soon later arrived photos of the dial let us think it might be an earlier version: a 3646 with riveted plastic dial. Maybe it would be a Ref. 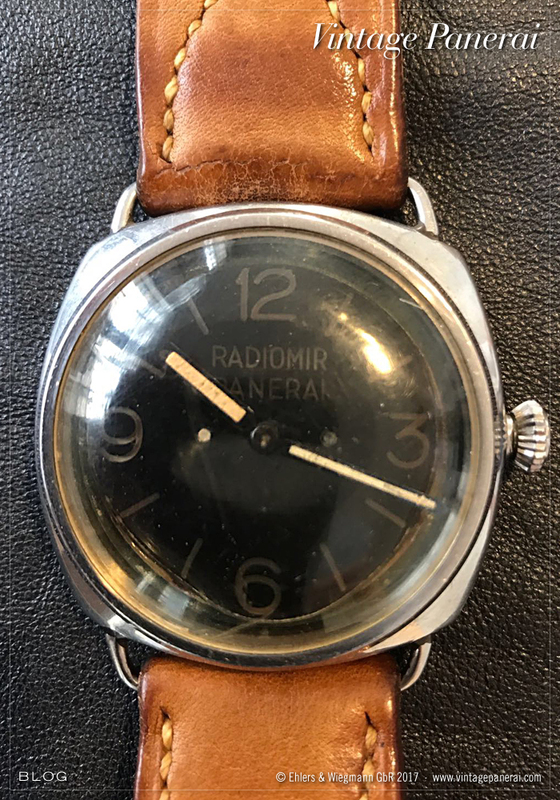 3646 / Type B like most of the watches with such dials are recorded? 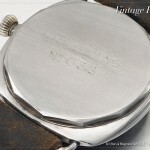 The final proof to which number group it belongs to, was the look onto the inner caseback of the watch: a Ref. 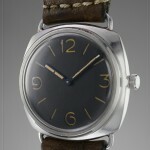 3646 / Type C with Rolex SA hallmark in the center and a seven digit number underneath the reference number 3646. 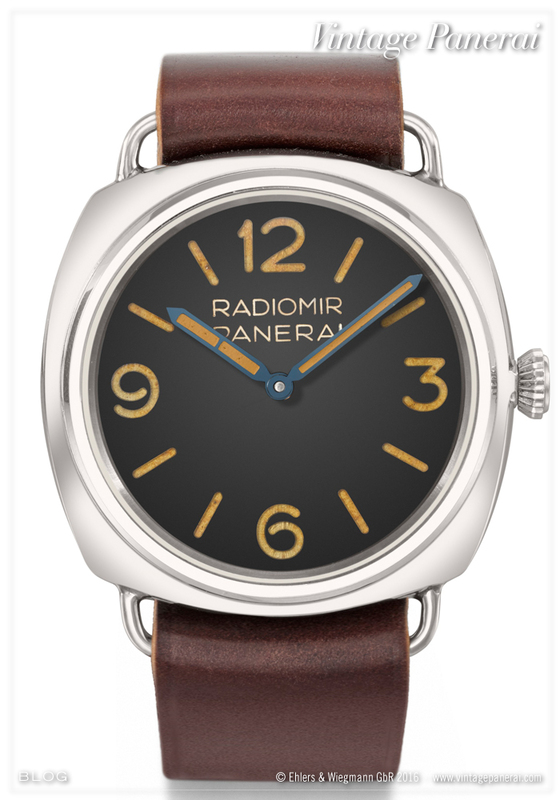 So, one more piece of the Vintage Panerai puzzle added in shape of a Ref. 3646 / Type C with riveted plastic dial. 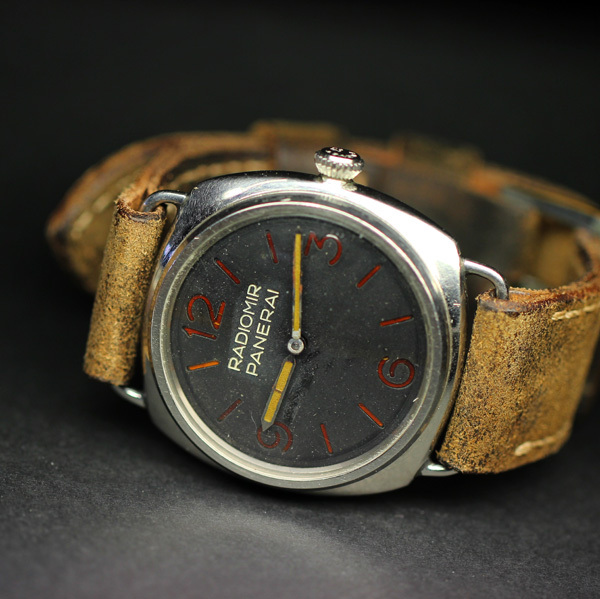 The remarkable “untouched” condition, since it was keepsake for the veteran and has remained in the possession of the frogman’s family during all these years (72 years, to be exactly), can be pointed out by the fact that the watch has still the original leather strap sewn onto the soldered lugs of the cushion shaped case and the nickel-plated brass buckle (in the typical “bottle opener” shape with sharp edges) as well as a Rolex 618 / Type 1 movement with details known in more than 90% of all recorded watches of the Ref. 3646 / Type C in our database. 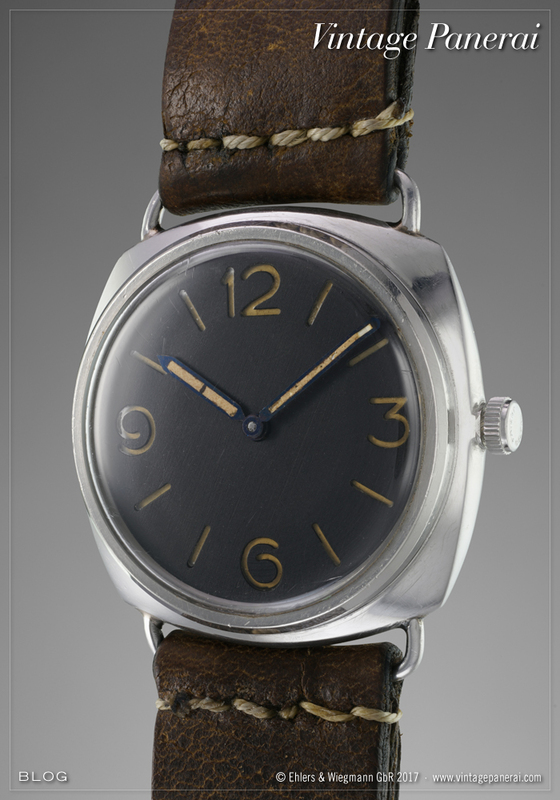 The still complete luminous material on the blued steel hands can be rarely found on watches of this age, as well as the original domed plexi and the onion shaped crown (“Brevet +” / Type 11). 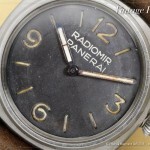 More about watches of the Ref. 3646 / Type C can be found in our book “The References” 1930’s-1940’s on page 248-397 in chapter II.III. Bonhams London will auction a Ref. 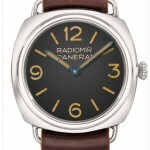 3646 / Type C with “Radiomir Panerai” dial in their upcoming Fine Watches and Wristwatches sale on December, 14th (Lot 88). The high bezel, as well as the Rolex 618 / Type 1 movement in combination with the half polished inner caseback, bearing the Rolex SA hallmark with reference and case number, are typical features of Ref. 3646 / Type C watches. The watch is recorded in our database since November 2016. Watches of the Ref. 3646 / Type C are featured in our book “The References” (first volume / 1930’s-1940’s) in chapter II.III (page 248-397). A watch with a similar shaped crown neck can be found on page 306-321. A chart on different decorative polish styles on the inside of casebacks on Ref. 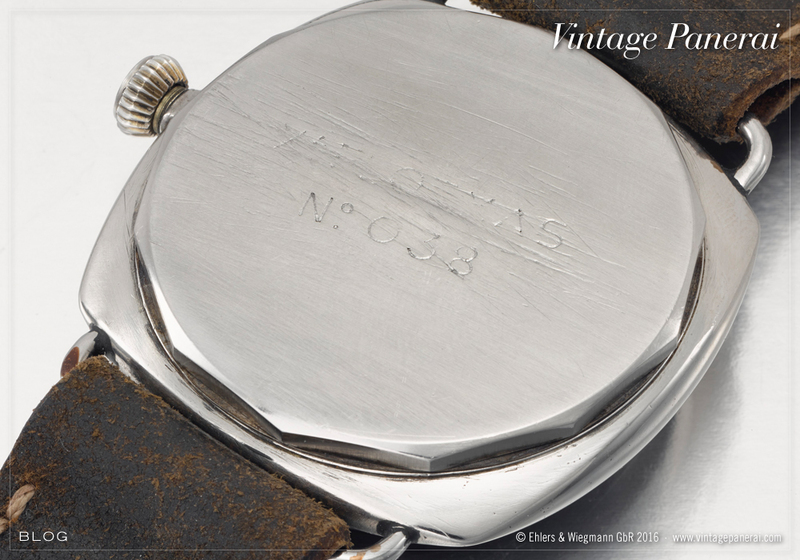 3646 / Type A – G watches can be found on page 486 in chapter II.IV. 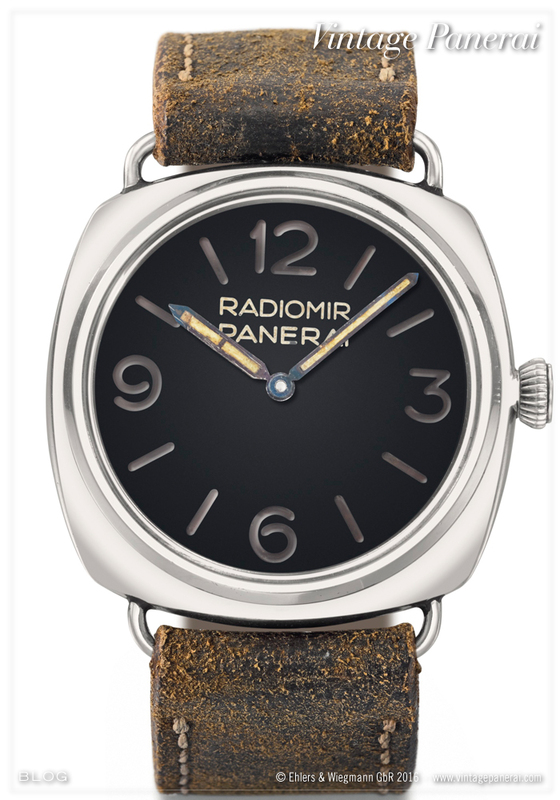 17-jewel manual wind movement, matte black sandwich dial with baton hour markers and Arabic numeral quarters, blued steel pointed baton hands with luminous inserts, polished cushion form case with screw down back, screw down crown, fixed wire lugs, fitted brown leather strap with polished buckle, together with Panerai Certificate of Authenticity, case and movement signed Rolex, dial signed Panerai 47mm. Please note this watch does not have a sandwich dial. 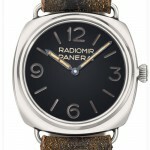 The dial is inserted with luminous material.